I'm combining two topics into this one thread. Both have to do with telephone service, but are not directly related. On the same thread was a link to this Youtube video. Which describes construction of the microwave relay link to bring radio telephone service to DV. It shows construction of the site and tower that connects SW to Cow Creek. That's the site you can just barely see from the highway as you're driving south out of SW. They call that little hill "Hill 254." They also describe construction of the power line that runs to that site. Who knew that, for the power line poles, they had to dig all the holes by hand? I had hoped to see something about the site on Mormon Peak. I believe that is the link between Cow Creek and the system outside DV. Come to think of it, I'd like to see a list of all the links in that service. Thanks for the link to that video! "An abandoned microwave repeater and associated buildings at the end of the Owlshead Mountains road will be reviewed, evaluated, and removed if no longer necessary. " Let us know if you find out more! Last time I was at that Owlshead Mts tower, in March 2014, a sign indicated the site belongs to a company called American Tower. So perhaps it is not abandoned! That company owns a lot of the towers I come across. They're the ones I reached out to, via contact information on their website. Who knows if they'll respond, though. My understanding is "American Tower" finds the location,procures the land, builds access, brings in the utilities, builds up the structures and then leases the backbone access to anybody to install equipment. They also manage the complex. I love detailed threads like this and the vintage video footage is a real treat. The combined memory, historical context, and perspective within this forum is a treasure. Just by chance, I have some more detail to add. Three years ago I took a hiking spin around the Hill 254 area not knowing it had a name and not realizing that there was a repeater tower hiding behind the summit on the south side. Well, I combined a condensed version of the construction of the tower (Thanks, Candace_66 for posting the long version), cleaned up the video quality (this was transferred from old-time VHS I'm sure) and added about eight images taken with my Canon Powershot camera. In this case it was AT&T that found the location, procured the land, built access and built structures back in the 1960s. The microwave long line service was shut down in the 90s and the towers and infrastructure sold off. American Tower bought a bunch of the old ATT long line sites. Many, especially in cities or near highways, have gained a second life for cell and other backhaul. Owlshead has seen no use since ATT shut it down way back when. Regarding "Hill 254", I did a little research. 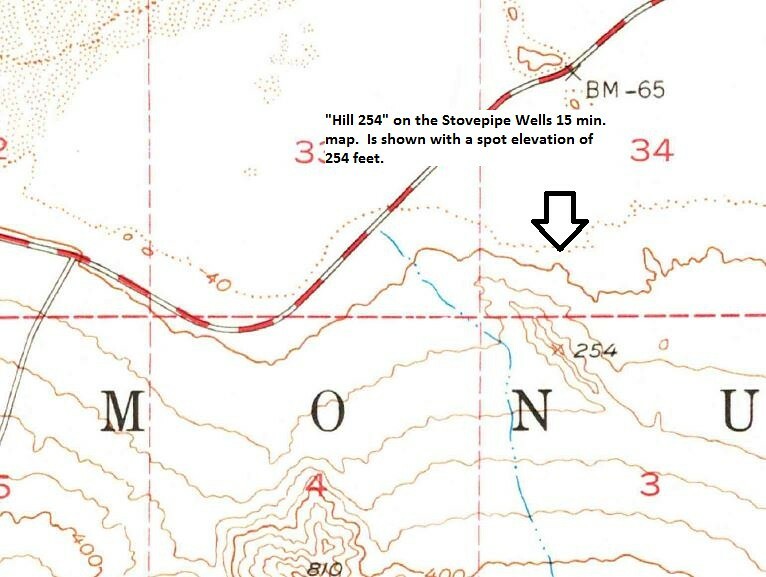 Turns out it was so named, because that hilltop is marked with a spot elevation of 254 feet on the Stoveipipe Wells 15-minute map. 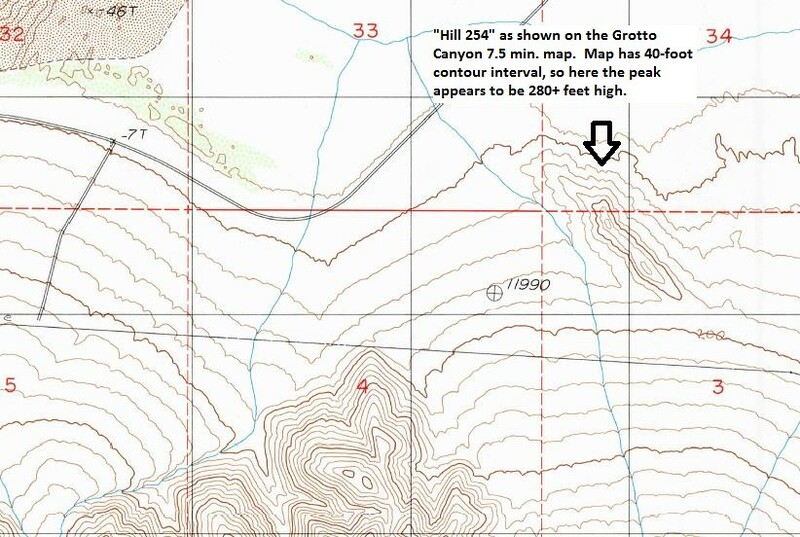 However, on the Grotto Canyon 7.5 minute quad map, the same hilltop "summit" appears to be above 280 feet. I'm interpolating from the contours, and the 40-foot contour interval on that map, because there's no spot elevation shown. That map is dated 1988, and the repeater station was built in 1986 (according to the video description on YT). The 15 minute map is dated 1952. So I'm not sure if I should put this on my peaks list as 254 feet, or 280+ feet. I don't suppose you brought a GPS with you, which would have given you an independent reading? BTW, that is a fairly signficant difference (254 vs. 280+). Did surveying accuracy (for height measurements in particular) improve that much between the 50's and the 80's?